The EU has increasingly favoured the use of economic or market-based instruments (“MBI”) – such as indirect taxation, targeted subsidies or tradable emission rights – for environment and related policy purposes because they provide a flexible and cost-effective means for reaching given policy objectives. The more intensive use of MBI has also been advocated in the EU´s 6th Environment Action Programme and the renewed EU Sustainable Development Strategy as well as the renewed Lisbon Strategy for Growth and Jobs. With the adoption of the Green Paper on market-based instruments (and an associated staff working paper) on 28 March, the Commission has asked a number of questions to help launch a discussion process on the potential for a more intensive use of these instruments, which will often be used within instrument mixes. Finally, the Green Paper explores how the exchange of experience/best practice between Member States on Environmental Tax Reforms could be stimulated. The paper will briefly review the areas that were addressed in the Green Paper and the Staff Working Paper of the Commission. Furthermore, the Green Paper invites comments on the questions by 31 July 2007. Thus the paper will provide an opportunity to give an overview of the comments received and it could discuss a first set of conclusions. Block tax exemptions or an EU Energy Tax for undertakings covered by the EU ETS? Since January 2005, European energy-intensive sectors, which include heavy industry and the energy sector, are regulated by the Energy Taxation Directive (2003/96/EC) and the EU Emission Trading System (ETS) Directive (2003/87/EC). Both regimes impose constraints on the decision-making process and activity of these companies aiming at reducing CO2 emissions at the minimum possible cost. Such double regulation might compromise the objectives set by the Lisbon Strategy. This strategy seeks to tackle the EU's urgent need for higher economic growth and job creation and greater competitiveness in world markets, aiming to provide people with a better standard of living in an environmentally and socially sustainable way. Several events in the EU agenda set the timeliness of this discussion. It is under way the revision of the environmental State aid guidelines (2001/C 37/03) and the approval of National Allocation Plans (NAP) for the second trading period (2008-2012). Moreover, by the end of 2006, the European Commission has opened formal investigations to examine whether Danish and Swedish plans to grant CO2 tax exemptions to companies covered by the EU ETS were compatible with EC Treaty State aid rules. It is therefore relevant to evaluate how the present regulatory overlap should be addressed. This paper introduces the contours of a possible approach to deal with the identified problem. The general approach necessary to tackle the cost efficiency problem associated to such overlap suggests either a block exemption from energy taxes for undertakings covered by the EU ETS or an EU tax charged on their energy consumption which replaced current national energy taxes. Environmental effectiveness would be served either by an EU tax or stringent NAP. However, revenue interests and the incapacity of the EU ETS to provide price uniformity for CO2 emissions might argue in favour of a tax approach taken at the EU level. The EU Emissions Trading System (EU ETS) that covers about 40% of total EU CO2 emissions is the biggest implementation worldwide of a cap-and-trade mechanism to curb emissions. This innovative policy instrument is both a milestone and a strong incentive for starting similar activities in other regions of the world. Since May 2006 the results for 2005 verified CO2 emissions on installation level thus providing indications about short and long positions for the first trading period 2005-2007 of the EU ETS. Based on data available for 24 Member States by January 2007 which shows an overall long position in 2005 for the EU, this paper uses a thorough data analysis for about 9,900 installations to investigate evidence on three issues: First, the stringency of the total allocation cap and differences both among the Member States and a selection of emission intensive sectors by identifying patterns of allocation discrepancies, the difference between allocated emission allowances and actual emissions; second, the distribution of the size of installations which is in particular relevant for dealing with very small and very large installations; and third, the spread of allocation discrepancies and possible allocation biases which might point both to successful abatement activities but also to distorting distributional impacts. 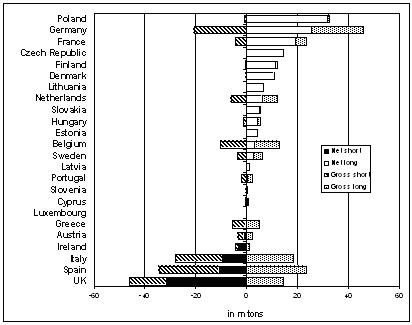 By focusing on evidence about distortions created by differences in the behaviour of Member States in their allocation policies and the distributional aspects of the EU ETS, this paper complements work presented by Ellermann and Buchner (2006) which emphasizes evidence on abatement activities. The structure of the paper is as follows. After highlighting the main features of the EU ETS, the principles for preparing the National Allocation Plans 2005-2007 are discussed. Subsequently, we present the methodology for the data analysis and indicators for stringency and distributional characteristics of installations and allocations. After providing some caveats as to the interpretation of the first year trading results in the context of competitiveness and abatement issues we draw conclusions that may be relevant for the EU ETS review. On a world-wide basis, the aviation sector is responsible for about 4% of global warming. In addition, aviation represents a rapidly growing sector where greenhouse gas emissions in the EU have increased since 1990 by 87%. So far, despite some initiatives to curb emissions from aviation by using market-based instruments such as kerosene taxes or CO2 emissions trading, the aviation sectors remains to be adequately coped with. Recently, initiated by a EUCommission proposal (EU 2006), the inclusion of the aviation sector into EU’s Emissions Trading seems to gain momentum. Using a broadened political economy approach (Rudolph 2005, 2006), the paper examines opportunities and obstacles of implementing tax instruments as well as emissions trading in air transport. This new approach differs from standard reasoning by taking Public Choice as well as Political Science arguments into consideration. Furthermore, it takes an in-depth view into transport politics in practice. Looking at different implementation processes in the past, decision making exhibits many similarities in actors’ interests, strategies, and their political influence and they as well show the importance of external situational and systemic conditions for individual actors’ behavior. These experiences from real-world politics, analyzed in a broad political economy framework, enable us to predict future obstacles and chances of implementing market-based incentives in EU climate and transport politics. This understanding of promoting as well as hindering factors will make it easier to gain societal acceptance to limits to the sky.